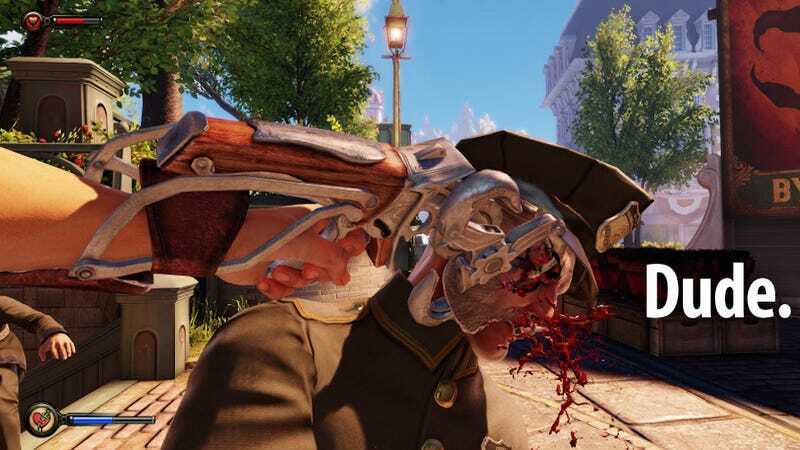 BioShock Infinite Is Insanely, Ridiculously Violent. It's A Real Shame. Okay, it's time to talk about it. About what, you ask? 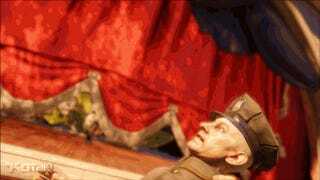 About how totally bananas the violence in BioShock Infinite is. The beginning of this game is astonishing. Flat-out. It's one of the most effective, intoxicating game-introductions I've seen in recent memory. So let's to do an exercise. Let's imagine watching the opening of the game as if we'd never played a video game before. For this exercise, you're not a person who plays games. You're just some person. You like movies and TV, you like stories, and you're interested in seeing what this game is all about. Maybe you heard about it on NPR, or saw a big story in the New York Times. It got you curious. You fire up the game. Opening scene: You're on a boat, in the rain. The people on the boat are speaking in riddles, and you're already intrigued. ...Dang this is cool. You come upon a guy who has been tied to a chair and shot. Okay, kind of bloody... the blood on the floor seems a bit over the top... but hey, alright. Dude is dead. Moving right along. You ring some bells at the top of the tower, Close Encounters-style, and crazy red light fills the clouds. BioShock Infinite is in many ways so, so close to being That Game, the one we can show to our non-gamer friends and say "See? Look at this! It is so awesome! Check out the story! It's like LOST! How neat is this?" But it's not That Game, because it's so hilariously, egregiously violent that a large number of people will never give it a chance. Levine has been outspoken about his ambition to please both the meathead and the brainiac since the release of the original BioShock. But what about my wife? What about the people who can stomach only so much aggressive violence and unchecked cruelty? Defenders of the game's violence have compared BioShock Infinite to Christopher Nolan's Batman movies, which melded together the cerebral indie aesthetic and the mind-numbing blockbuster spectacle. But every comic lover knows the difference between Booker DeWitt and Batman. Batman doesn't kill people. I tend to look for games that I could show to my sister, and have a similar feeling to Plante about Infinite. I wish I could show her this game, but after about the hour-mark, I'd lose her attention. She'd see the absolutely insane violence of the melee kills and say "Well, this is dumb," and get up to go do something else. So, the guy that brought you a chainsaw gun would now like to get on his soap box about violence. Have fun judging me. Funny, right? That I’d say that? I know, it’s weird. Maybe it’s the fact that they did such a fantastic job of making this nuanced world that hitting you over the head with those moments felt out of place for me. When the guy whose game featured a reverse up-the-crotch chainsaw melee kill is telling you your game is too violent, it might be worth listening. The penultimate stretch of the game involves coming to terms with the memory of a dead character. Again, it's an important story moment, one that calls out for a sensitive handling. Instead of solving a puzzle, or navigating dialog, or any of the ways that you might be expected to confront long-suppressed emotional pain, the ghost challenges you to three long and frustrating gunfights. Yes, you shoot a bazooka at childhood trauma. In most games, absurdities like this don't bother us, because we don't expect much from most games. 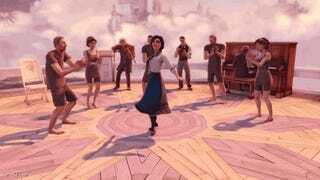 In BioShock Infinite moments like these, when the demands of genre bleed into the narrative, we feel disappointed, even betrayed. And on, and on. Yesterday, I wrote an analysis of Infinite's combat that took the violence as a given, and simply talked about why, in my opinion, the shooting doesn't work all that well. But even then, it's difficult to talk about the game's combat without talking about the elephant in the room: The fact that by simply existing, the violence harms the game. Brilliant as the game is - and as earnestly as it tries to explore social-political issues - Infinite is tethered to its mechanical nature as a shooter in ways that undermine its aspirations. It's possible to love the game for all it does (and tries to do), but still feel smothered by its insistence that so much of my experience is delivered staring down the barrel of a gun or other destructive weapon. The issue for me isn't about being pro or anti shooting games; it's about how standard FPS design limits the narrative possibilities of a game that clearly aspires to dig deep. How might I have behaved, and how might I have reflected on Infinite's provocative world had I not spent so much time shooting or avoiding being shot? The game's story isn't really about shooting at all, but the player's lived story is, and that collision is hard to overcome. "In terms of the shooting, it's weird, right? Games have this interesting thing. 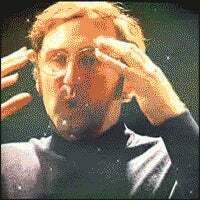 When you see some people experimenting, like Kentucky Route Zero and stuff like that where they are starting to experiment with sort of not having a game element or even Walking Dead has a really reduced element. My problem is, I like games. I like challenge. I like having a skill component of it. And so what is that skill component? It is weird in some ways that all of a sudden you bust out a gun and start shooting. It would make sense maybe in a [Levine interrupts himself] but the scale and the amount of shooting that you have is heightened obviously, but, you know, so is Indiana Jones. The dude is an archeologist and he's busting caps in people's asses left and right. He probably kills 100 people in that thing." "It's a limitation of the medium," Levine said. "I can sit down and write a scene about just about anything. It's really tough to make a game about any particular topic. You go see a movie like Margin Call, which is a fascinating exploration of how emotionally and the kind of pressures that led to the financial meltdown were on people. To turn that into a game would be a real head-scratcher. But to turn it into a movie is really a function of: can you write a good movie about it? Because you don't need that skill component, and you don't need to sort of train people on the systems and things like that [as you do] in games. "So we tend to have fewer forms in the game space. One of the nice advantages of a form is that it's a skill-set that people have acquired. And remember that if you hand a controller to somebody who has never played a first-person shooter, it's not something you were born with. So, you know there are certain advantages it gives you." Okay, so people know how to play shooting games, and it's good to have a skill element to a game. But with a game as thematically and creatively ambitious as BioShock Infinite, is that really a strong answer? Particularly if, as Levine says at the end there, it presupposes that anyone who will enjoy your game must first have the requisite first-person shooter skills? My inner cynic, of course, says that BioShock Infinite is a shooter because shooters are relatively safe from a marketing perspective. Shooters sell, and there was a lot of money riding on this game selling a lot of copies. But even that feels like a possibly unnecessary abdication of artistic license. Particularly because one of the best things about The Walking Dead, which Levine also cited, was that I could recommend it to anyone. 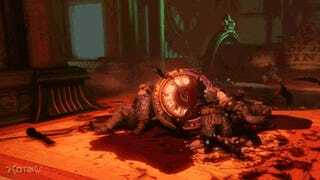 And hell, that was a game with no shortage of extreme gore (though the gore itself felt more congruous with the game's setting and source material). I loved how I could recommend The Walking Dead to friends without having to ask if they were familiar with first-person control scheme, with thumbstick navigation, with how iron-sights worked. There are really two issues here: The fact that Infinite is a shooter, and the extremity of the violence it depicts. 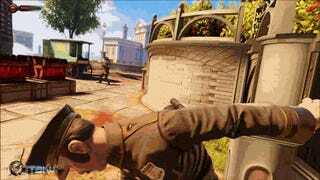 The further I get from the game and the more I replay it, the clearer it becomes: BioShock Infinite is a daring, audacious game held back by its reliance on the gun in the middle of the screen. What if it had been a first-person exploration and adventure game? What if there had been less shooting, and more puzzles and traversal? What if Booker had been more of an actual private investigator, rather than a commando for hire? And even if we accept that Infinite had to be a first-person shooter, did it really need to be this violent? It makes sense to create some awful sort of counterpoint to the opulent brilliance of Columbia, to frame shocking violence against the bright blue skies and breathtaking vistas. But the violence here, in the melee kills in particular, just doesn't quite work. It feels indulgent and leering, like a concession to a perceived audience that may not even exist. Who really wanted sick badass head-trauma in this game? Not me, anyway. It's too bad that Infinite has to be a case-study in unnecessary video game violence, but perhaps it's good to have a case-study that feels so definitive. The ridiculous violence stands out in such sharp relief when placed against the game's thoughtful story and lovely world. Hopefully, Infinite's immense popularity will inspire other game-makers (or even Levine, in his next game!) to try something different, and to give a story like this the framing and support it deserves. And in the meantime, hey, I'm actually okay with ripping digital heads off, as far as it goes. I've been playing video games for ages, after all. But I think I'll hold off just a little while longer before I start calling my sister into the room.